Dental Arcade Game at Eureka! Over the last couple of years, I have been running a citizen science project called the Dental Arcade Game (see this blog post). The project aims to improve the reference data used by Forensic Anthropologists to estimate the age of unknown remains (especially children) from dental eruption. Dental eruption (i.e. when teeth poke out through the gums) happens at roughly predictable times during childhood. However, the reference data routinely used by Forensic Anthropologists is outdated and very population-specific, and needs to more data from more people. So, we need a way of getting lots and lots of dental eruption data from people of known ages. This is where citizen science and the magic of social media comes in! We need people (especially children) to participate in our short survey, where they give their age and tell us which teeth they have in their mouths and which have fallen out. The survey has received ethical approval from the University of Huddersfield Research Ethics and Integrity Committee, and is completely anonymous. It only takes 10 minutes, and you can do it online. You don't need any special equipment, just a friend to look at your mouth, or a mirror to look at your own mouth. You can also look at the Dental Arcade Game website, where there are quizzes and arcade-type games to play, such as Mouth Invaders and Plaque-Man. It also includes more information about Forensic Anthropology and how you can get involved. You can also follow the project on Twitter @Dental_Arcade. This summer, we have been very lucky to be invited to share our research at the Eureka! National Children's Museum in Halifax. This is a really vibrant, exciting museum that caters for children of all ages, with super interactive exhibits about the body, the weather, digital science and much much more. Our Dental Arcade Game is on in the All About Me zone, which allows children to explore digestion, senses, bones, babies and food. Our activity fits in very well, as it encourages children to think about their teeth, and give us valuable data by showing us which ones have erupted and which ones are loose. So far, we have had very good feedback and the visitors have loved getting involved. We are next at the Eureka! Museum on the 1st and 2nd of June and the 29th and 30th June. Come along for a fantastic day out! We will also be having a stall and activity centre at the Festival of Childhood at Huddersfield University on the 22nd and 23rd June. Come along and get involved in our citizen science project! I am Principal Enterprise Fellow* in Forensic Anthropology at the University of Huddersfield. I read Archaeology and Anthropology at Oxford University, and specialised in Forensic Anthropology through a Masters, PhD and lots of casework. I am an expert in forensic osteology (bones) and decomposition. 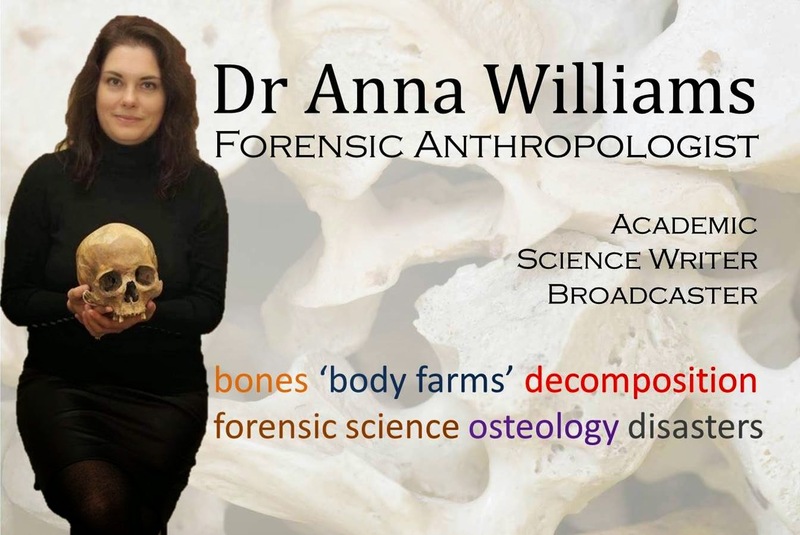 I am passionate about science communication through a variety of media, and have appeared on TV and radio discussing anthropology and forensic science. I was a 2014 British Science Association Media Fellow for New Scientist. 10th April 2019, Annual Student-Led Forensic Science Conference, Staffordshire University, 'The Case for a Human Taphonomy Facility in the UK'. 11th April 2019, Institute of Animal Technology Congress, Liverpool. 'The Case for a Human Taphonomy Facility in the UK'. 13th April 2019, Rugby Archaeological Society, Rugby Art Gallery and Museum, Rugby, 'Does the UK need a 'Body Farm'?'. My You Tube channel is here. You can find out more about Forensic Science at Huddersfield here and on Facebook, here. I should say that the views and opinions expressed here are mine and mine only. Copyright Dr Anna Williams 2011. Picture Window theme. Powered by Blogger.